We have been having regular visits from this flock of turkeys-23 is the most we have counted so far! Today, Mom and Dad and Bill and I traveled to attend church with Caleb and Cassandra and her family and get to meet her church family. What a privilege to attend church with them and get to meet everyone. After services, the ladies of her church held a shower for her and invited us, too. Caleb and Cassandra received a lovely selection of gifts, here she is displaying the dishes from me, Marsel, my sister and sister in law. She was thrilled with Mom's crocheted table cloth. So glad to have Cassandra in our family! Today was the day to finish Mom's wall hanging. Now it is ready to go back to her for the binding! The colors play nicely together! My faithful feline fellow, PuffDaddy! During the week, Mom and I each made a quilt for QuiltsForKids.com and so I loaded them on the frame today and finished Mom's and have several rows done on mine-nice, bright fun fabrics! After just an hour they have expanded greatly. Ready to drain and add some fresh flowers to the vase-the water stays in the beads for 30-60 days! The azaleas are really making their presence known! Even the bees are coming out to enjoy them! This is under my magnolia tree, coming up the driveway. The dogwood is beginning to lose its bloom as the leaves come out. 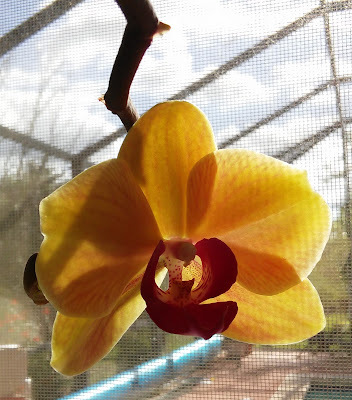 It is looking like Spring on the inside, too; the orchid is doing its thing-the blooms are larger and hardier looking this year-the plant is larger so maybe that is why. I love to wake up to these blooms! We have been adopted by this neutered male cat-very sweet and very hungry. I think the people down the road moved and left him behind. He comes and visits in the house but does prefer his freedom. And for the record, I am not the one that initiated this adoption-Bill is the father of this adoption! I made a matchbook type fold of this cardstock to make a sewing kit for the bride of the family wedding next month. I have never been to a wedding where there wasn't a last minute panic for some pins or needle and thread so I thought this might come in handy. ....and some safety pins for the last minute mend! I loaded up Mom's wall hanging on the frame. This will be quilted to match the quilt already finished . While hunting for fabric for the wedding ring pillow (more on that in the near future), I found my bag of sewing knick knacks to go in the shadow box. Now that I can see what I have, I will be able to add to it at the local antique stores. I blended several fibers for this skein of yarn made from the undercoat of my sister-in-law's beloved yellow lab which died, a little bit of wool and some seacell fiber for softness. I will be knitting a coin purse for her. We also got two sleeping bags finished! Many hands make light work, indeed! I started the day with a little sewing while Bill was getting ready........I finished the quilt of Mom's on the frame and loaded up a little one for Mille and finished it! A nice all over meander if just right for this one using variegated purple thread. Then we tackled a big job today-I started out myself but ended up needing some muscle. We have 3/4 of the room finished....we have to enclose the area around the air handler before I can lay the rest but I am thrilled with our progress today! the guys whipped the van into shape. We even sat for a concert from the kids. and I got some knitting done in the evening. A new quilt from Mom is on the frame. One of the blessings of having my daughter here is the joy of working together-I mean, I know what it is like to have a clone because we just work so well together it is like having two of me--not just to get the chores done but also to savor the joy of company for the rest of the day, well, it is beyond words. Yes, the week rushed by but we cherished every minute. I did a marathon of quilting to get the table runners done while I waited for Marsel and kids to get here yesterday! The first one was an all over pantograph and this one was free motion quilting. Millie brought me this Quilt for Kids top on which I used a bumblebee panto to quilt it. Nyki helped me unload the air mattresses to get ready for two of my sons, Cassandra and her two sisters to come this weekend-Hotel Minota is almost at capacity! Musical beds anyone?! Today, we went to the Main Street Grill in DeLand to celebrate my Dad's birthday! We did a little shopping afterwards to walk off the calories. And then back to their house to open his present and enjoy cake and ice cream -so nice to share the day!